The praise has been effusive on social media for the Bronze but in reality with only 6 teams in the competition and the bottom three being Kazakhstan, Tunisia and Colombia the goal was Bronze as a minimum going into the competition. None of the three teams out of the medals have a senior team in the World Series and it would have been a major upset if they had claimed a medal. There was little doubt that NZ would win Gold but France have been inching ahead of Canada at the senior level and were decisive winners at the junior level this tournament. Defeating USA in the qualifier may be the larger accomplishment on the pathway to this Bronze medal. The next question is how many of these players will advance to the senior ranks? Three players featured in the two tries that pulled a potentially embarrassing loss into a Bronze medal celebration. Madison Grant the speed merchant who scored a solo try to start the comeback, Taylor Black the play maker, and Carmen Izyk who used a cool head and some good footwork to score the winning try. Extra pressure was on the line in Monday's fixture against France, as a win would see Canada into the Gold Medal final against New Zealand. Delaney Aikens scored two brilliant tries and Madison Gold added another, however France was took dominant as they ran away with a 33-19 victory in the final pool match. With the loss, Canada finished the round robin stage with a 3-2 record. 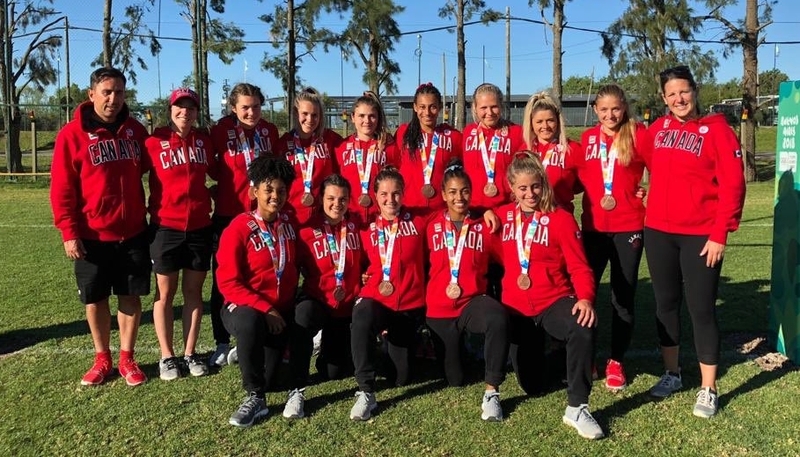 Canada pulled off a come-from-behind victory against Colombia to win the bronze medal match on Monday afternoon and finish off the tournament. Speedster Carmen Izyk sealed the game with a try after she outpaced the defenders for the win. Canada opened day two with another stellar performance against Colombia, scoring five tries en route to their third victory of the tournament. Keyara Wardley scored Canada's lone try in the loss as she showed her incredible pace to beat two defenders. However, the advantage fell to New Zealand as they ran in four tries after showing considerable patience and skill in each build up. Canada and France are tied in the standings, the winner will go into the gold medal match versus NZ, the clear favourite and the only undefeated team in the women's tournament. The loser will go to the Bronze match as clear favourites. The deciding match takes place at 6:15am PT on Monday. Canada breezed through the other teams based on physical superiority but when they faced NZ a team of equal physical stature and it came down to rugby smarts and skills there was only going to be one winner. Both France and Canada lost to NZ by similar margins, Canada by 15, France by 14. Canada boasts some impressive athletes but the rugby smarts and skills aren't quite similar to the NZ athletes, we'll find out whether they're equal to French standards tomorrow. One example was Canada's handling of NZ kickoffs, several times in a row NZ kicked to an area where it bounced and wasn't fielded, something that's considered poor form in 7s. None of the players could react to the situation and the kickoffs kept going to the same spot, with the same results, to NZ's advantage. The difference in rugby culture between the two countries means NZ athletes develop faster with Canadian players often getting a later start and a steeper learning curve. Canada and France seem to be evenly matched and it should be a close contest. Canada opened the tournament with a 24-15 victory over Kazakhstan, who qualified as the Asian representative in the six-team event. Canada took a 17-0 lead into the half time break, but let their guard down early in the second half and allowed their opponents to score three quick tries to bring the game within two points. With Madison Grant in the sin bin for a yellow card, Canada stole possession and Carmen Izyk used her pace to sprint around the defender and touch down under the posts. Canada scored early and often in their second game of day one, while only allowing one Tunisian try in the victory. With the win, Canada sits in a three-way tie for first place with New Zealand and France with six points after two games.